I have never run with music. For safety reasons, I don’t encourage running with music unless you are running on a treadmill. My pre-marathon favorite is shrimp in garlic olive oil over linguine with a glass of wine. My post marathon is pizza and 2 beers! My running club the Alpine Runners on Tuesdays, Wednesdays, Saturdays and Sundays. Being able to run marathons for the rest of my life. When running a marathon expect the pain and except it. The better you except it the easier it is to finish well! I run to stay fit. It also helps me balance my life it relieves a lot of stress. I also love challenging my body’s limits with long runs and feeling great afterwards! My best running experience was my second marathon. After my first one I never wanted to run another marathon because I didn’t know how to train for one and it hurt so badly. I trained the right way for my second one and felt great during the entire marathon. My first marathon was 5:02:22 my second one was 3:37:17. With the right training I was able to take off over an hour off my finishing time. I love being able to help first time and experienced marathoners reach their marathon goal and have a better marathon experience. I can no longer have the great feeling one gets when running their first marathon, but I can feel it though them every time I am able to help them get through their first marathon! 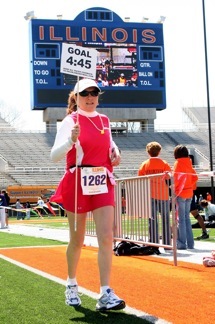 My best pacing experience was pacing the Green Bay Marathon in 2007. My group did so well as a group. I encouraged the group to take off for the last 3 miles. When I entered the stadium the group was all together half way around the track ahead of me cheering me in. A couple of those were runners I picked up at 18 miles feeling the wall. They stayed with me and finished way ahead of me. I was never so proud of the pace group. I hope to have more groups like this again! Besides having the experience of running over 100 marathons and over 30 ultras. I have helped train thousands of runners reach their marathon goals the right way through the right tools in marathon training programs I have organized in the Chicago area. I have a lot of running experience and have made a lot of mistakes. Through these mistakes I have learned a lot to help you from making those mistakes and have a great marathon experience. I will be giving advice thought out the entire marathon to help runners get thru the rough parts. The most important tips are first, don’t do anything different! Run behind me by staying at an even pace and not start out too fast. Start out well hydrated and stay well hydrated though out the marathon. Run tall to make sure you are breathing and getting enough oxygen into your lungs. Run positive and smile! Don’t let those bad demons talk to you out of a great experience. Keep smiling because you never know when the cameras will be on you and that picture shows up in your hometown newspaper! I am president and founder of the Alpine Runners the largest and best organized running club in the Chicago area. We have well over 500 members and focus on all levels from the first time 5K runner to the ultra runner. We are a social and fun running group that helps all runners reach their goal! I encourage all runners to be a part of their local running club. If you don’t have one, start one! You can check out the RRCA (Road Runners Club of America) website at www.rrca.org to find a club near you or how to start a running club. I was also Central Regional Director for the RRCA for 4 years and I am presently the IL State Rep for the RRCA.